I am a Registered Veterinary Nurse here in Cara Vet Group. Ever since I was a child, I've been in love with animals and always knew I'd want to work with them. I used to read animal encyclopedias for fun and watch Animal Hospital and Animal Planet on TV. I started as a student on placement in 2013 and then worked part-time in 2014. In 2016, I became full-time and have loved every minute and learned lots. I work with the Vets and other Nurses to help our patients back to health. I'm involved with medicating animals, surgical prep, patient monitoring and running diagnostics. 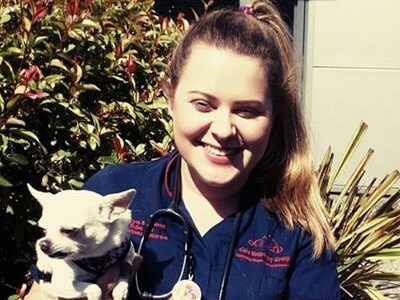 I gained a Distinction in the FETAC Animal Care course in Killester and then went on to do Veterinary Nursing in Dundalk I.T. I graduated and became a Registered Vet Nurse in November 2016. I love providing patients with care and making their stay with us as comfortable as possible. I love learning from co-workers and bettering myself. I especially love the job satisfaction that comes with watching sick animals recover. A boarder collie called Coco. She was the nicest dog, so sweet and she was the dog in which I placed my first IV Catheter. She went on to make a full recovery. Also, a little kitten called Spagooder! Micha was an early Christmas present and the best present I ever got! Jasmine and her brother came to us in Cara Vets at just a few weeks old. When her brother passed away I ended up falling for her and adopted her. Santa and my parents chose Micha for my sisters and I. We fell in love with Roxy when researching our first dog. I brought Jasmine home from the Vets for a weekend and she decided she wasn't going back! Micha loves sleeping and cuddling up for rubs whenever and wherever she can. Roxy loves eating and doing tricks for food! She loves sleeping and making blanket caves in my bed. Micha generally chills out her golden years, but when she was younger, she was known as 'the kangaroo' because she hopped around on back lets. Roxy in general is a loon. Jasmine is a menace to birds and hunts them any chance she gets... much to my family's dismay!